Los Angeles (CNN) In what can often be a divided world full of bitter political battles, social and economic injustice, racial and religious persecution — it’s easy to get lost in it all. So how do you find your way? Your purpose? Dan Eldon found his early, and risked his life — ultimately losing it — to document and aid those struggling with war and famine in Africa. He died as he reported on the civil war in Somalia in 1993. Now, his story is a feature-length film on Netflix. Writer and director Bronwen Hughes came across Dan’s story by reading the aptly titled book, “The Journey is the Destination” — compiled by Dan’s mother, Kathy, based on the dozens of journals he left behind. Dan Eldon was born in England in 1970. When he was 7 years old, he moved with his parents and younger sister Amy to Nairobi. The color and chaos of Kenya was ideal for this dyslexic kid with wild ideas. Dan trailed his mother, Kathy, a newspaper journalist who championed activists and nation-builders in her columns. His young mind was captivated by these societal pioneers. “These people didn’t necessarily ask permission and they didn’t necessarily get licenses but they solved whatever the problem was and I got to write about it,” Kathy Eldon told CNN. Barely a teenager, Dan was already earning photo credits in the newspaper and Kathy encouraged him to find his own important stories. “When he was 14, it was very logical for him to find a solution to a little girl who needed a heart operation,” Kathy said. He designed boxer shorts and T-shirts and set up bake sales and dance parties to raise money to pay for the surgery. Then, he helped support a Maasai mother by buying and selling her handmade jewelry to put her kids through school and later organized a dangerous trek across five East African countries to bring desperately needed aid to a Mozambican refugee camp in Malawi. Dan believed that “we can all create positive change.” That message was stamped on his DNA. He bled for his work, found freedom in adventure and lived life as a safari. “He was an activist. He was a humanitarian. He had a lot of fun doing good in the world. He was bold. He ran at life,” sister Amy Eldon told CNN. With each excursion, Dan filled the pages of his journals with words of wisdom and richly textured artwork that tackled good versus evil, the role of violence in society and the effect of war on humanity. His work in Somalia exposed him to all of those and more. Acting on a rumor about famine in the town of Baidoa, Dan did what he’d always done — grabbed his camera, hopped on a plane and set off on a journey in search of the truth. When Dan arrived, he was horrified by what he saw: scores of dead babies, skeletal children and starving adults. Dan’s pictures were published in newspapers around the world and were among the first to expose this growing humanitarian crisis. As famine turned to civil war, Reuters spotted Dan’s work and hired him to document the increasingly dangerous situation on the ground in Somalia — becoming the organization’s youngest-ever correspondent. Amidst the tanks, bullet holes, fire and fury of war were images of fatigue-draped soldiers extending compassionate hands to children and villagers rejoicing in fleeting moments of peace. Even in a war zone, Dan found ways to connect. The locals referred to him as “the mayor of Mogadishu.” He wore a monkey mask and danced around to break the ice with kids who had seen far too much. They trusted him. He was one of them. But then, on July 12, 1993, US helicopter gunships targeted a compound that they believed was a gathering place for Gen. Mohamed Farrah Aidid and other warlords. The bombs killed dozens of people, but Aidid was not among them. Dan was at his hotel at the time of the raid. His bags were packed. He was scheduled to leave for Nairobi later that day. But when several witnesses arrived at his door asking him to photograph the carnage, Dan and four other colleagues headed out to the scene. He knew the risks. But Dan knew these people and felt safe. Once they entered the compound and began snapping pictures, an angry mob turned on them. Their cameras were met with stones, knives and fists, as enraged locals took out their ire on Dan and his friends. Dan and three other journalists were killed. He was just 22 years old. For more than two decades, Kathy persevered through many rounds of financial backers and cast changes before finally realizing her dream. 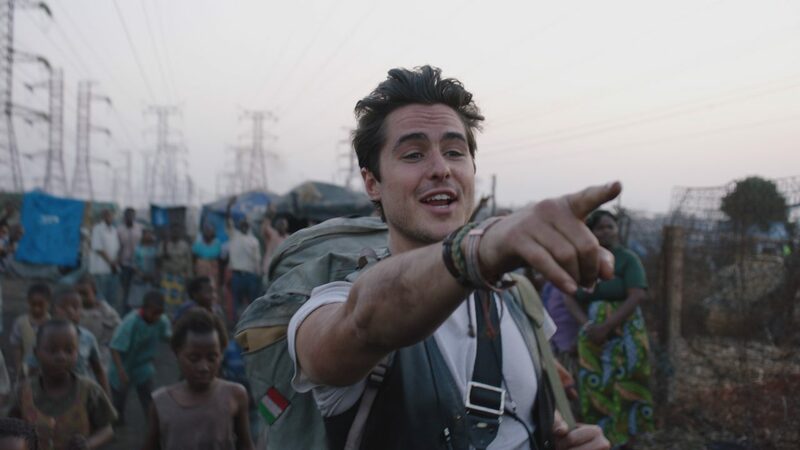 “The Journey is the Destination,” starring Ben Schnetzer as Dan, Maria Bello as Kathy and Ella Purnell as Amy, premiered at the 2016 Toronto International Film Festival and earlier this month began streaming on Netflix. Maria Bello told CNN she actually met Kathy several years before she was cast to play her, something that helped her bring authenticity to the role. In addition to the movie, Dan’s legacy as a global activist lives on in an organization called Creative Visions. Founded by Kathy and Amy, the non-profit aims to spark awareness and ignite change through impact media, the arts and technology. To date, Creative Visions has reached more than 100 million people through 260 projects and productions focusing on social, humanitarian and environmental issues, and through its “Rock Your World Youth Empowerment Program” that teaches students about the Declaration of Human Rights and gives them the tools and resources to advocate for issues that matter to them. “If each one of us resolves to not look away,” Kathy Eldon says, change can come. “We have to look towards; we have to see ourselves in that other person. Realize that we are all one. You may not be able to go to Somalia or Yemen. But we have to be aware; we have to vote; we have to be informed citizens; we have to watch the news; we have to take a stand and move towards the people in need who could be us tomorrow.